For decades, Camp Quinebarge has been a premiere summer camp destination for international campers looking to spend a summer in the United States. Ours is an intentionally inclusive community, where children grow, learn, and make everlasting friends, regardless of national origin. International campers experience American culture first hand, from holiday celebration for Independence Day, to traditions such as hiking in the White Mountains, trips to local attractions, and more. 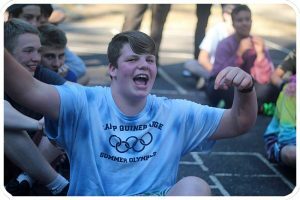 But Camp Quinebarge is so much more than a cultural exchange – campers form memories that will last a lifetime, make friendships that cross borders, and find a second home on the shores of Lake Kanasatka. Whether campers hail from across the globe or down the road, getting here, and keeping in touch, are simple. Quinebarge offers airport transportation from Manchester-Boston Regional Airport (MHT) and Boston’s Logan International Airport (BOS), as well as linens packages and toiletry kits for campers flying in. Campers are met by our friendly, welcoming staff at the airport, and transported to Camp in our own vehicles. Once campers arrive, we offer an e-letter service to expedite communications between campers and their families. We scan, email, and print letters to and from our international campers daily, ensuring that they are able to keep in touch with those at home. 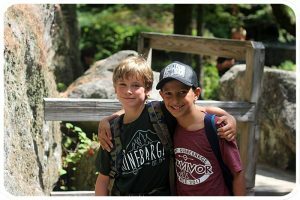 Many residential camps boast perks of attending for their international campers, with language development and cultural exchange at the top of the list. Camp Quinebarge, however, offers so much more. 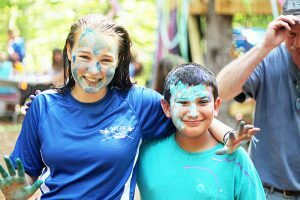 Yes, campers improve their English skills and experience a new culture, but more importantly, they have a ton of fun, and form bonds that truly last a lifetime. We regularly receive visits or messages from alumni, who speak dearly of camp friends (with whom they’re still in contact), whom they met 20, 40, or even 60 years ago. At Quinebarge, campers choose their own schedules on a weekly basis. This means that campers can do what interests them, rather than following a group schedule. And with something for everyone – field sports, high and low ropes, climbing wall, horseback riding, hiking, canoeing, kayaking, paddleboarding, tubing, swimming, arts & crafts, ceramics, woodshop, drama, nature, biking, tennis, basketball, volleyball, and more – we guarantee that campers will love their activities and go home more confident than they were before.